Resources are managed on the Spaces Management page. 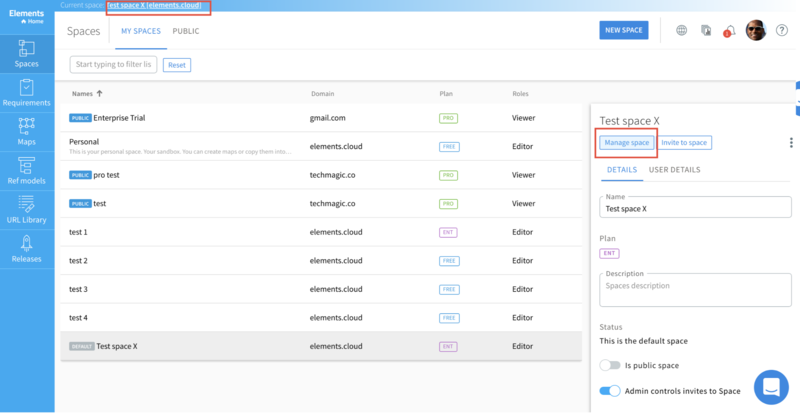 You can access space management either through the Space name at the top of the page or through the right panel for a selected Space in the Spaces list. Resource Managers (these are specific user rights) are able to edit and delete resources in the Resource Library. They can also edit the details, such as the type of resource. To edit the name of the resource, just click on its name in the right panel and start typing. If you copy a map from a different Space which has resources included on it, those resources will be copied into the Resource Library. This will not happen when you simply copy-paste activities or diagrams between spaces. 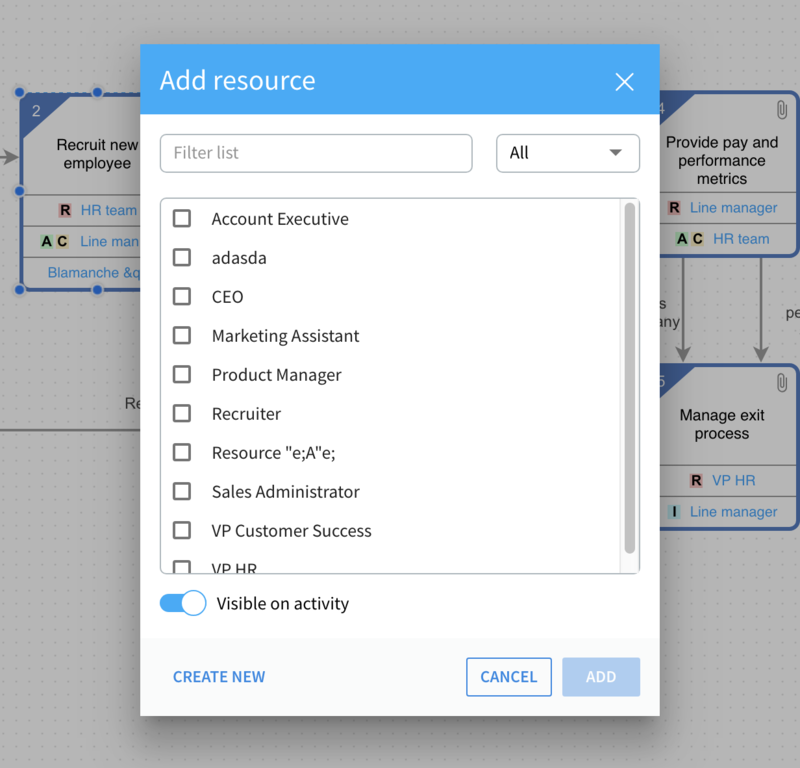 Since any map copied into a Space will copy in all resources associated with a Map, you can build a hierarchy of your organization with names or notes in the activity boxes and the resources attached to each box. When you copy this to a space, it will pre-populate the library with the correct resources. You can add single or multiple resources to an activity box. This is the "Who". At the highest level of description, it is generally "who" is accountable for the performance of the high level activity between the scope of the input ("when") to the output ("why"). For example, the person responsible for the high-level activity of selling products and services, from the input of lead, to the output of revenue, might be the Chief Revenue Officer (CRO). As you go down deeper into process detail, the activities represent individual steps, and the resource will tend to be the person/role responsible for actually carrying out the task. You can however allocate roles & responsibilities even in more detail using our RASCI functionality. Resources are usually human, but can also be a system or a location. All three may be involved on a given box, depending on the level of detail you want to capture. You can then report on resources across a map or scope of diagrams. Then you can filter to see all activities carried out by a certain resource. Depending on how you have mapped, this is a very powerful way to generate the relationships between activities and roles (and if you choose to add them, systems and locations). Those, combined with the user definable Data Tables, make for very powerful analysis capability. Useful Tip: you can Ctrl-drag resources to copy from one box to another on the same diagram. You can drag and drop to move them. Right-click on an activity and select “Add resource”. The list of available resources will show up. You can filter it by type or by name. You can also attach multiple resources at a time. You can also "hide" resources, i.e. add them in a way that won't be displayed on activity itself but they will still be visible in the right panel & in all reports. To do it switch "Visible on activity" at the bottom of the screen to the left. If the resource does not exist, click "Create new" in the bottom left corner. Select the type of resource [ human / facility / system ] and hit CREATE. Copying a resource is easy. 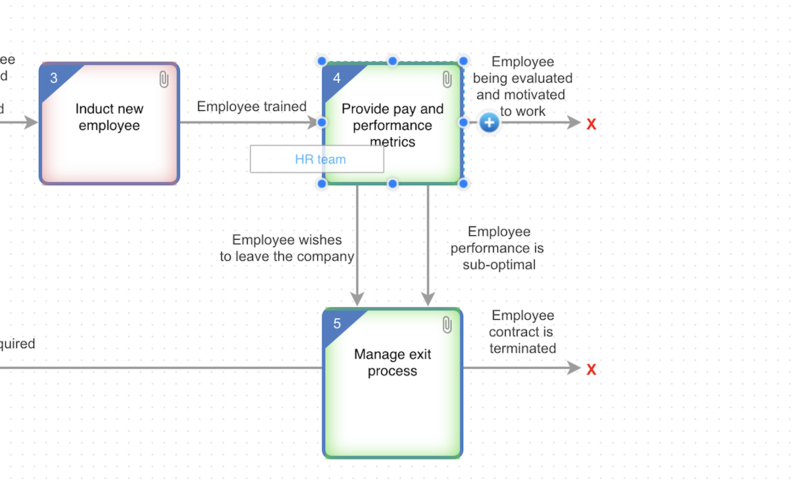 You can Ctrl-drag resources to copy from one box to another on the same diagram. This is a major time saver. You can also drag and drop from one box to another. The boxes that you can add a resource to are highlighted in green. Those with this resource already attached are in red. To delete a resource, roll over it and click on the "x". 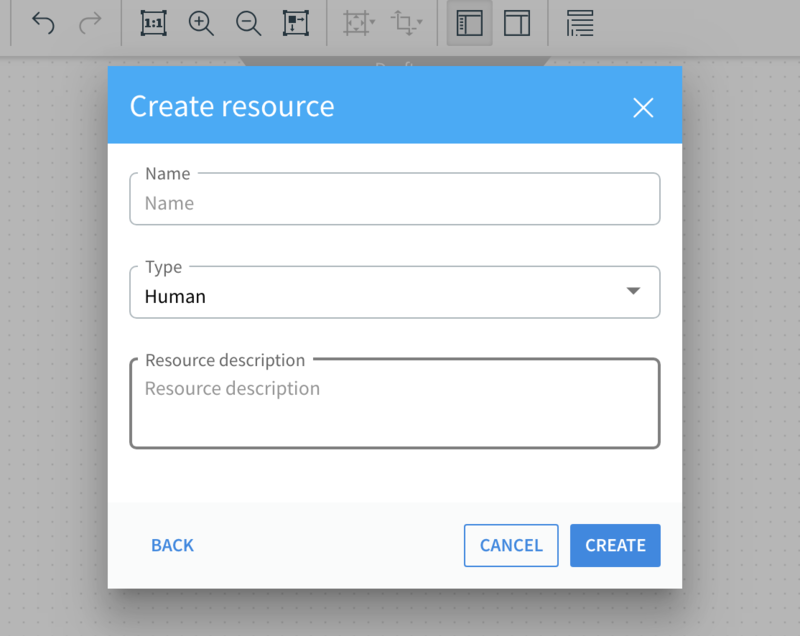 To reorder the resources open the right panel for an activity and reorder resources by drag & drop in the right panel. You can report on resource allocation across your map in order to, for example, highlight all the activities a given resource is involved in, or understand the relationships between activities, roles and the systems or facilities used. Combining with Data Tables, you can expand the scope and value of those relationships. See [metadata structures] and [reporting].